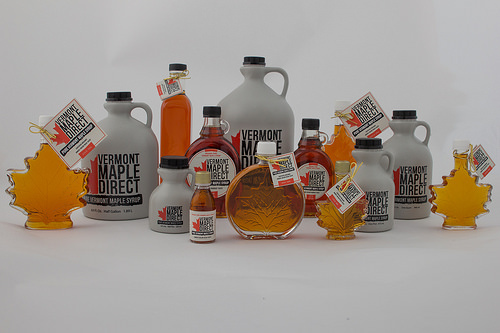 Whether you’re a chef, food manufacturer, or retailer, Vermont Maple Direct is committed to meeting your wholesale maple needs. The demand for maple’s unique flavor profile is virtually exploding with an ever expanding line of maple-sweetened products, from yogurt, ice cream, baked goods, and snacks, to beers, beverages, glazes for meats, and flavorings for every dish imaginable. Vermont Maple Direct's pure Vermont maple syrup is non-GMO. We offer both conventional and organic certified maple syrup. Each and every batch produced and container filled, is documented and traceable, from the day it's made to the day it's delivered. We recognize and are committed to satisfying the unique needs of our wholesale and bulk maple syrup clients. A comprehensive inventory, quality, and consistency are what you can expect from our product line. Ask about our expanded glass packaging line, exclusively for wholesale customers. Private labeling is available for many of our containers. One gallon, five gallon, and fifty five gallon quantities are available for those consumers requiring large volume. Call (802)-793-3326 now for pricing and orders, or fill out the form below and we will contact you promptly! Call or email to request our wholesale products brochure.